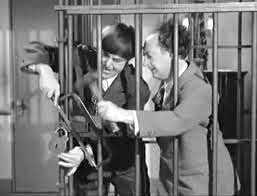 In Crime on their Hands, the Three Stooges are janitors at a newspaper office — who desire to be reporters. 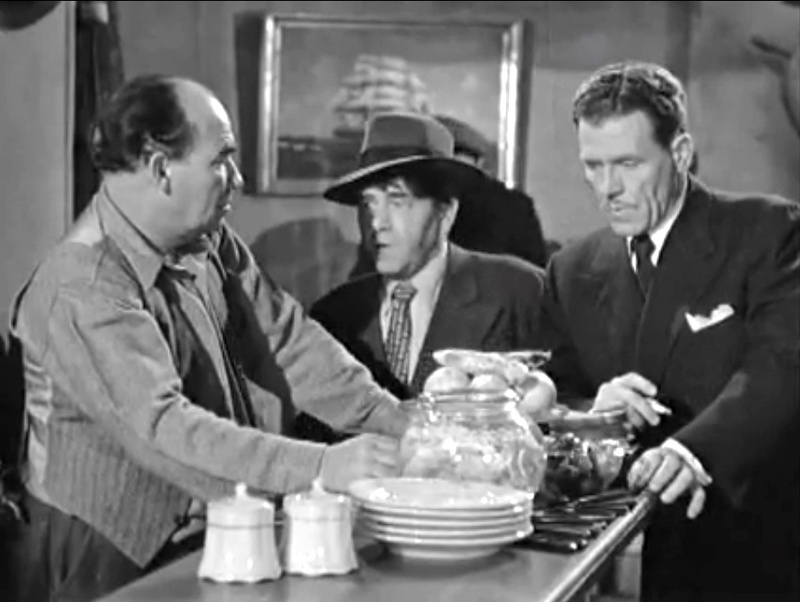 They have their chance, when the big story of the day is the theft of the Punjab Diamond by Dapper Malone (played by Three Stooges regular Kenneth MacDonald), his moll (Three Stooges regular Christine McIntyre) and “Runty” who gets angry at Dapper. Runty decides to get even by calling the newspaper office and snitching on Dapper. The Stooges are there to take the call, and get their big break — while Runty “gets” his, courtesy of Dapper’s gun. Moe, Larry and Shemp begin snooping around at the place where Dapper’s hiding. And soon they’re questioning Christine McIntyre, who wrongly assumes that they’re the police. While talking with her, Shemp begins tossing candies from a bowl into the air and swallowing them. Unknown to him, the missing diamond is in the bowl, and he unintentionally swallows it. Once the Stooges reveal that they’re not police, Dapper and another confederate come out of hiding. They decide to perform an impromptu surgery on Shemp to retrieve the diamond. Moe and Larry attempt to retrieve the diamond in a non-fatal way (well, non-fatal for them, anyway — using an ice tong down poor Shemp’s throat), but they fail. Dapper tosses them into a closet and ties Shemp down as he prepares for the “surgery”. Moe and Larry decide to not give up without a fight, however, and using a bag of tools they conveniently find in the closet, they try to cut their way out the back wall of the closet, into the next room where they can call for help! Unfortunately, there are two things in the way of this plan. One is the fact that Moe and Larry get more in the way than out of the closet. The other is that there’s a gorilla in a cage on the other side of the wall! Larry goes through the opening first, and the gorilla beats him up worse than Moe typically does — and Moe gets his just desserts next. The gorilla then goes through the hole, subdues the bad guys, and releases his “buddy” Shemp. 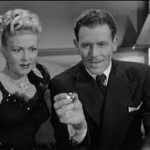 I love the ending — “Well, I helped.” It’s a very funny short film, one of the best of the Shemp era, and highly recommended. Shemp (Shemp Howard): Moe, Stop the presses. Moe (Moe Howard): You didn’t see that movie too did ya? Larry (Larry Fine): No, I’ll take orders chief. Moe (Moe Howard): Good. [slaps Larry] That was for absolutely nothin’. Moe (Moe Howard): What was it? 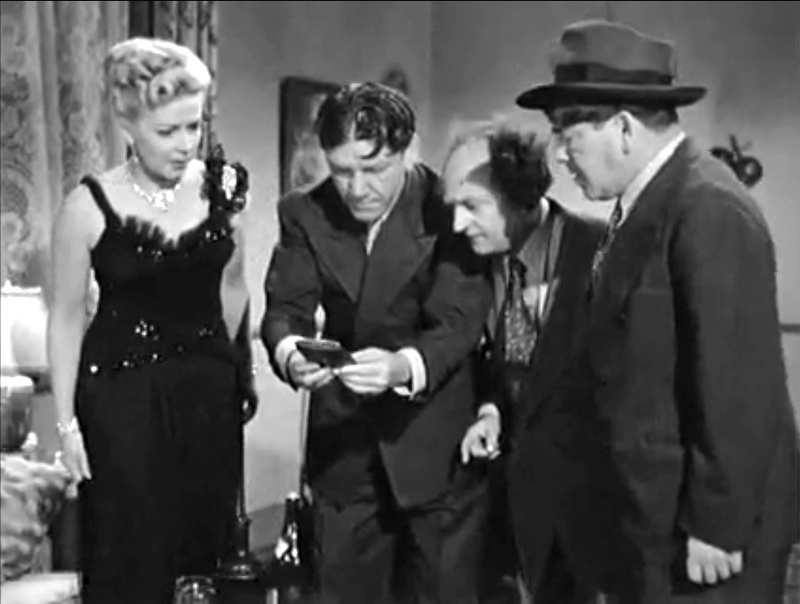 Shemp (Shemp Howard): Wrong number. Shemp (Shemp Howard): A hundred karats? He sure knew his onions! Hee, hee, hee, hee! Larry (Larry Fine): [upon finding Dapper’s cigar case] Evidence! Let’s weight it! Shemp (Shemp Howard): Let’s smoke it! 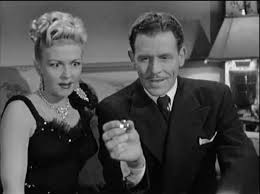 Bea (Chistine McIntyre): Any half-wit can see I’m innocent. Shemp (Shemp Howard): Yeah, I can see you’re innocent. Shemp (Shemp Howard): [tossing candy into the air and swallowing it] With oranges, it’s much harder. 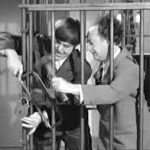 Moe (Moe Howard): What happened? Shemp (Shemp Howard): She fainted. Moe (Moe Howard): She must have got a good look at your puss. Moe (Moe Howard): [trying to pull the diamond out of Shemp’s throat with ice tongs] It must be caught on something. Larry (Larry Fine): Maybe it’s his appendix. Moe (Moe Howard): We’ll soon find out! Larry (Larry Fine): We’re trapped like rats! Moe (Moe Howard): Speak for yourself! 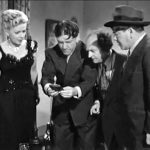 Shemp (Shemp Howard): Cut it out! Cut it out! Dapper (Kenneth MacDonald): That’s just what we’re planning. 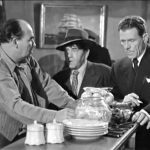 Shemp (Shemp Howard): 50karatss! What an icecube!